Nordic Textile Art is the host of Nordic Textile Meeting -The Value of Textile Art. 19-22.3 2015. The meeting takes place in Nordic Culture Point in Helsinki. During four days members from Denmark, Finland, Iceland, Norway and Sweden will meet for networking, discussions, workshops and lectures focusing on the Value of Textile Art. This is an event by NTA in collaboration with TEXO the Finish Association of Textiles Artists. Textile talk 2. Helena Hyvönen, (Finland). Pecha Kucha night at Aalto University. Workshop "The Value of Textiles - Added Value"
Organizers: Nordic Textile Art, NTA, www.nordictextleart.net in collaboration with TEXO www.ornamo.fi. Introduction: Our conference 2015 is this year placed in Finland. Nordic Textile Art wants to create forums for discussions about contemporary textile art. The annual meetings are held circulating in the Nordic countries. The conference theme is The Value of Textile Art. The artistic idea of the project is to shed light upon the theme from different aspects by seminars, workshops, exhibitions and educational visits. The Value of Textile Art is a theme with an extra - Added Values. A clear change in the society can be noted, the interest and knowledge about textiles is increasing. Many artists use either textile materials, textile techniques or textile expressions in their artistry. Short notes on the speakers. Britt Smelvær grew up in Årdal Norway and was educated in weave. In 1978 she debuted at UKS and has since had many exhibitions and commissions. In the period from 1993 to 1997 she was a professor at the Department of Textile Art School in Bergen. From classical tapestry weaving to installations and geometrical and ornamental structures, she is a kind of postmodern nomad as art historian Jorunn Veiteberg describes her. She reflects over her work and about the artist who has a astonishing versatility, surprising, dynamic, shape fresh and colorful. She is an artist with great desire and ability to exploration and experimentation. The term textile is highly expanded and stunning images show, among other artworks made of materials like feathers, horsehair, branches, fiberglass, wood and metals. She has completed a numerous amount of public commissions, which she is working right now in Norway. Is textile something more than a material? Helena Hyvönen has worked as Professor of Textile Design since 1998 at Aalto University School of Arts, Design and Architecture and its predecessors. She has been working in several leadership positions as rector as well and her last leadership position was the Dean position of the School until 2014. Helena Hyvönen graduated from the same University in 1974. Her design company Hydestudiot Ltd. (1997–2006) operated in the field of material development, color design, and trend forecasting. Mrs. Hyvönen has designed industrial textiles and unique pieces of textile art which were on shown in various public spaces. During her career she has held numerous positions of trust, for example in the Arts Council of Finland, Turku 2011 Culture Capital Delegation, Board Member of Design Museum, Helsinki and as Vice Chair of the International Design Foundation (WDC12 Helsinki). Key note speaker and moderator ”The Value of Textile Art” Panel discussion. Linda Fagerström; art critic, PhD in art history. ”The Value of Textile - Added value” based on waste and recycled materials. Both versions include visual introduction to the waste - material jewelry. The aim of this workshop is to understand, handle and to work with the value of textile materials. The added values are recycled materials, what extra value the forgotten and forsaken materials give to a piece of jewelry or art. The memories and meanings are and can be hidden in the material choices, in the worn way they exist. When old and recycled materials are bound together with different textile-or contemporary technics, new inventions and new meanings are born. The experiment starts with material choices. The materials we use in the workshop are waste materials, left over textile and other materials, which can be further worked on or just put in to another meaning. We have also old books available that can be used and worked out to jewelry with different methods. The element of play and exploring is present in the workshop. Also the materials can be worked out with paints etc. The work itself can be small or bigger depending on the time available. We gather a collection to exhibit out of the works done during the workshop. One big target is to get familiar with each other by working together and to widen up own knowledge and to see what others do. Also through that understand each other and to have new contacts in our field. Pecha Kucha Night. 6 min. presentation, for participants at the meeting as well as students of Aalto. Laura Isoniemi will be hosting the Pecha Kucha at Aalto University. Textile walk will take us to see some of the most interesting pieces of textile art in public premises in the heart of the City of Helsinki. The participants of this tour will see 3 - 4 creations of different artists from different periods of time. 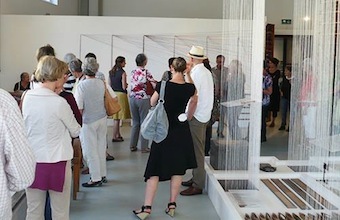 The curated exhibition Mini Textile. March 20st Opening at Nordic Culture Point. Curated Mini Textile Exhibition is a starting point for a series of exhibitions which will be presented also in Tampere Arts and Crafts Center Verkaranta and in the Craft Museum of Finland in Jyväskylä. It's also an introduction to TEXOs 60 year celebrations in 2016. The Finnish Association of Textile Artists TEXO was founded in 1956. Its members are textile artists and designers, whose professional field encompasses art textiles, industrial product design, handcrafted items, teaching and working for trade and PR. TEXO´s 60th anniversary in 2016 will be celebrated by the Finnish Textile Triennial in Tampere. TEXO chairperson Juha Laurikainen, board member Laura Isoniemi. ORNAMO is the second oldest existing organisation for designers in the world. ORNAMO is a member of NORDIC DESIGN IMPACT, aiming at promoting Nordic Design in the world. ORNAMO has over 2100 members. There are five organisations within ORNAMO, one of them is TEXO for textile artists and designers. NTC is a reference group to NTA’s Nordic unity. The NTC acts as representatives of NTA in their respective countries. NTC involves two people from each Nordic country.